For bookings and more info regarding Baia Sportsfishing Lodge click here Baia Sports Fishing Lodge. They say you lose more Bass than you catch, and after a recent 5 day trip to Baia Sportfishing Lodge in West New Britian, PNG, I would have to agree. The journey began at Port Moresbys international airport and on to Hoskins Airport in West New Britian. Across a glassy ocean we headed northwest towards the village of Baia, home to Baia Sports Fishing Lodge, a project developed as a partnership between the people of Baia and Liamo Reef Resort in 2004. As the trip commenced, the sounds of the jungle echoed throughout and a cunning looking crocodile watched us pass through his patch. It was game on, and after a decent fight I had my first PNG Black Bass in the boat. It fought hard, it was only 10lb and all I could think of was how it would feel to hook up to something ten times that weight. In the river systems of Baia, history has proven that these fish are still there and have been caught. On the other boat Veronica successfully landed a 36lb Black Bass. This would become the biggest fish of the trip. Into the night and the search for the mighty Bass continued. Suddenly the tranquillity was broken and I was on. Peeling over 20 meters of line in a few brief seconds, with drag tightened to the max, I simply could not stop this fish. I switched from aft port to starboard and in the process; the rod was swiftly snatched from my hand by this monster Black Bass. As I watched $750 of my favourite barra rod and reel being towed through the water by a 40lb Black Bass, I was starting to think that this fishing trip may have taken a turn for the worse. What followed had to be seen to be believed. It happened in slow motion, and watching my favourite rod and reel get towed through a crocodile infested creek by a potentially record breaking fish was as slow as it gets. Our local guide Gab quickly reached for another fishing rod, and with one quick cast meters away hooked my rod and began to reel it in. As he applied more pressure, the Bass miraculously cut my 80lb leader and allowed Gab to retrieve the rod and reel. The fish was gone, the rod and reel was saved and all this took place under the cover of a dim spotlight and half a moon. 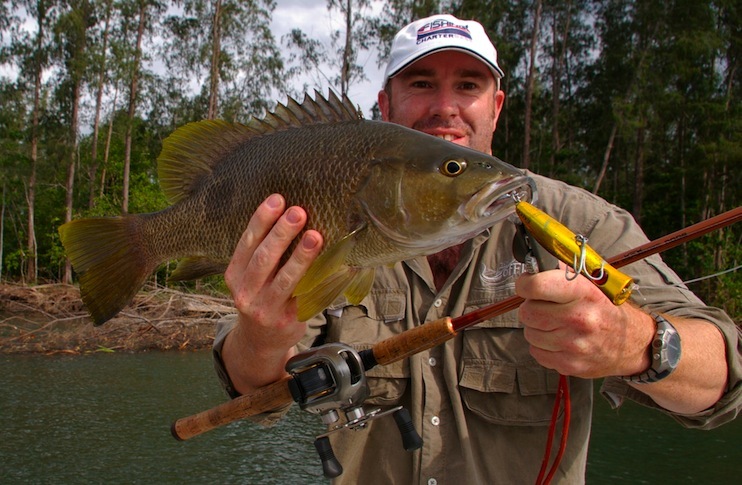 My chance at a record-breaking PNG Black Bass was history, at least I still had my favourite rod and reel! 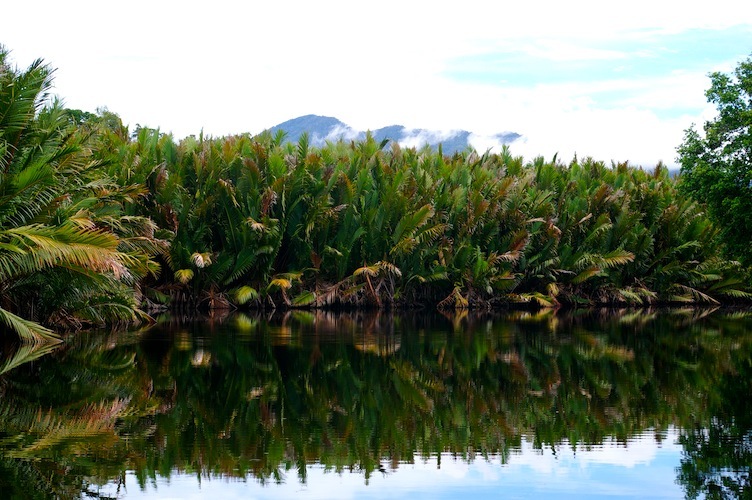 It is difficult to properly describe the combination of PNG Bass on surface popper – the noise it makes, the water it displaces and the action that follows. In the space of 20 minutes, all three anglers caught Black Bass off the same snag. 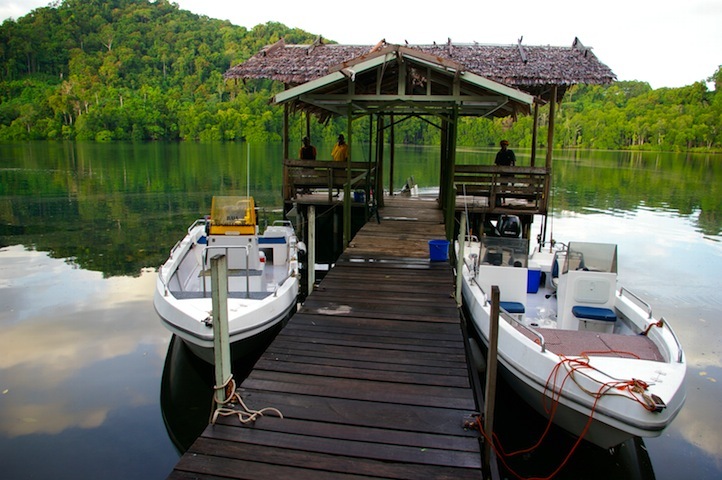 Every hour on the water is different at Baia, one minute you are fighting giant PNG Bass up the rivers, the next you are catching Yellowfin Tuna in the ocean, and then you get to witness all manner of marine and wildlife all under the watchful eye of the Ulawun volcano. Just when things were starting to get quiet I caught my first Spot Tail Bass, and my first PNG Bass on a popper. 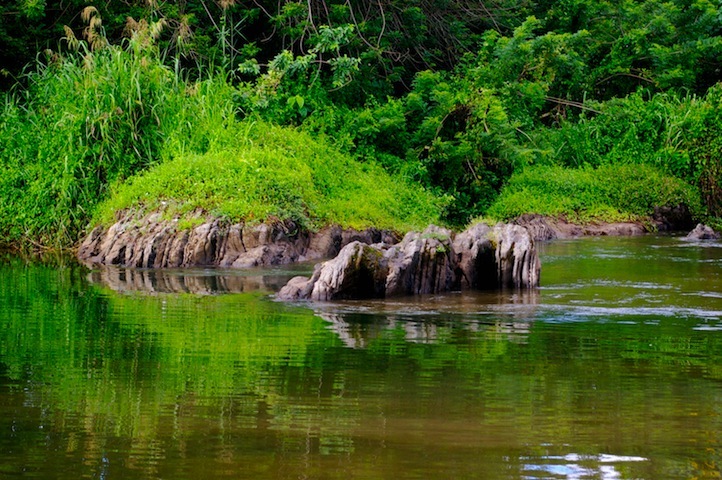 There is no bigger angling contrast than enjoying the peaceful sounds of the jungle meeting the ocean one minute, and hearing and feeling an explosion of power on a surface popper the next. This fish absolutely smashed the water around my popper, and with some more great boat handling, we managed to drag it out of the snag and successfully land it. After a pretty decent cast using a popper, Mat hooked onto a fish that witnesses describe as a “monster Bass pushing the 60lb mark. Yet again, the victim was his leader snapping as the biggest Bass of the trip, and possibly the year, took off with lure in mouth and leader in hand. These are fish that make you question your knots after every few casts. These are great sports fish, and in the utmost of sportsmanship, these are fair game. The target fish on this trip were Black Bass and Spot Tail Bass however plenty of other species were caught on this trip including Yellowfin Tuna, Rainbow Fish, Trevally, Cod, and some of the biggest Mangrove Jacks I have ever laid eyes on. This was an exclusive adventure and for me, will be a twice in a lifetime experience. Having now caught my first Black Bass and Spot Tail Bass, Im keen to return for more. As I see it, tenacity and tackle (the latter being the most important of all) are the necessary ingredients if one is to successfully conquer PNGs mighty Bass. This the angling adventure of a lifetime and I’ll be returning for more. 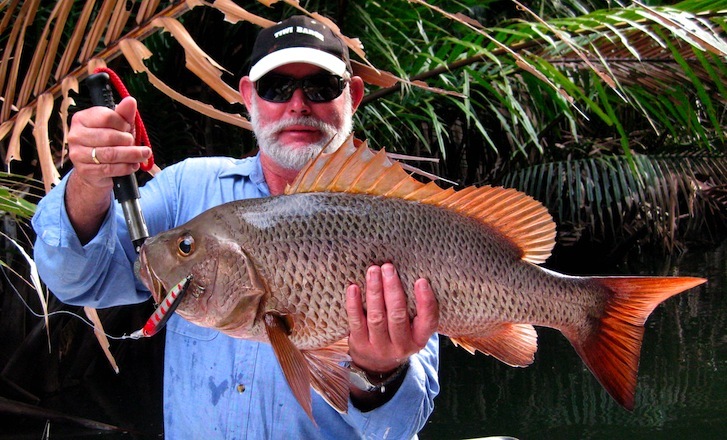 For bookings and more info regarding Baia Sportsfishing Lodge click here Baia Sports Fishing Lodge.